You know it's a safe hotel when the airline crews stay there too. What the... WOW! I love all the little details...they even have the little rolly suitcases! Nice architecture. The different setbacks really give it some depth. And the texture choices work well. It's a shame there's no easy way to recess those windows into the walls without having to carve out the shape with hundreds of column pieces. Which for a cityscape, is hardly worth the hassle and the pieces. At the angle you've shown it disguises that well. The game could really use some more walls that have openings for windows. Or just like, half width walls..
Protruding windows are actually realistic for renovated buildings so, if that's the look you're going for, no problem. In such cases, the original single-pane windows were flush with the outer wall or slightly inset but the modern, energy-efficient double- or triple-pane windows, with air space between the layers of glass, are that much thicker. Rather than reduce interior space, the renovators tend to poke such things out beyond the exterior wall a bit. Protruding windows, tinting, and the use of large pieces of glass that mostly fill the window opening instead of multiple small pieces, are clues that you've got a renovated building that is probably up to a recent or even the current version of the fire code as opposed to some time-worn thing which might have been compliant with the old code when built but which decades of neglect, vandalism, and under-the-table modifications have turned into a disaster waiting to happen. I focus on such minutia of buildings because I've been trained to do so. These clues say a lot about potential conditions inside and the usefulness of thermal imaging cameras (TICs) from the outside to locate the fire. Multi-paned windows blind TICs to interior conditions (their whole purpose is to block heat flow) but, OTOH, such updates often require the installation of a sprinkler system if the building didn't have one to start with, along with many other things to make the renovated building compliant with newer versions of the fire code, so conditions are more likely to be better inside than beforehand, at least in some ways. Naturally, it's not all good news so there are new hazards brought by renovations to worry about today that didn't exist when I was starting this career, but the point is, you can get a good idea of where you stand just by a quick scan of the building's exterior, if you know what to look for. Eh, most buildings like that aren't trying to make their glass THAT much thicker. You're dealing with inches here, not feet. And these really old city buildings can have much thicker walls since a lot come from before curtain walls so the brick is extra thick cause it's load bearing. I too am overly focused on the minutia of buildings for the same reason. An issue like protruding windows would be a big sticking point if you were renovating one of my buildings. I've seen HUGE fusses about little issues like this. For me it's usually involving getting room for lights in the ceilings. And architects don't want to change their ceilings, or give you more space for anything. The bad I see in renovations is that all the codes and standards and permitting and considerations that are needed to be met makes it really really expensive to do renovations. And buildings then get left in a state that's far older and more unsafe than any reno improvements would make it. I had a person tell me that he always knew he was at a decent hotel if he saw an airline crew there. At the time I thought that was odd but it makes sense, I don't think and airline would purposely jeopardy their crewmembers safety by putting them in areas of ill repute. SO naturally I had to add some in-game PlanCo Air crewmembers on a long overnight, waiting for the bar to open (or at least for a socially acceptable time to start drinking). There's a hotel I stayed at in Boston that was an old sewing factory renovated into a boutique hotel. I was personally a fan, classic New England factory shell with an industrial modern new flair. They installed new windows but from what I recall they simply replaced the old ones and the new modern windows fit in perfectly (unless they had an amazing mason on hand for seamless brick work). However in the guest wings they had random antiqued posts in the middle of the hallway which I assume were structural and just poor planning. I always found it comical every time I was there as I was being a typical millennial and ran into it once while looking down at my phone. Thanks guys for the commentary. I do agree PC needs some windows that sit more flush with the wall pieces or wall pieces that have recesses for windows (although that sounds a bit more limiting. I tried to sink those particular windows back as far as possible, and that seemed to be the final product, at least on the front most facades. HOWEVER lets just add that to the long list of things we would like. I too am overly focused on the minutia of buildings for the same reason. Yeah, it's a tricky issue. Fire and other safety codes are quite literally written in blood. Folks think they have adequate codes until an unanticipated disaster happens which makes them add a new section to prevent that happening again. But the new stuff is rarely made retroactive because of concerns about expense and loss of business during the work. That's OK as long as the building is kept in good condition and serving its original purpose. 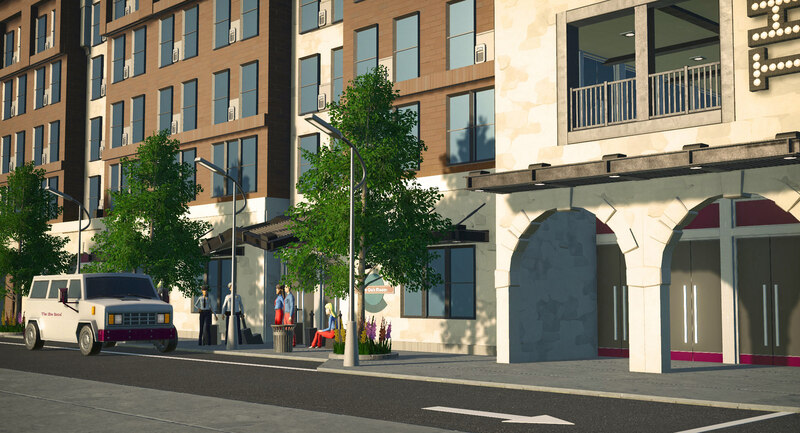 It's when the purpose of the building changes (like turning an old factory into apartments) that it has to catch up with all the code changes since it was built. But at least at such times, the building is not in use so there's no loss of on-going business. However in the guest wings they had random antiqued posts in the middle of the hallway which I assume were structural and just poor planning. I always found it comical every time I was there as I was being a typical millennial and ran into it once while looking down at my phone. That's weird. The fire code has 2 main aims: 1) to prevent fires from starting, and 2) if a fire does happen, to get everybody out quickly and safely. Thus, there's a lot of verbiage, the result of numerous infamous disasters, about keeping the means of egress clear of obstructions, due to the likelihood of panicked herds stampeding in the dark. There must have been a lot of argument over allowing those columns in the halls during the plan review process. @JohnyCanon8: I love the style of the buildings and I would stay there! @Aemjay: Very nice light post. The font on the signs is also a nice touch! 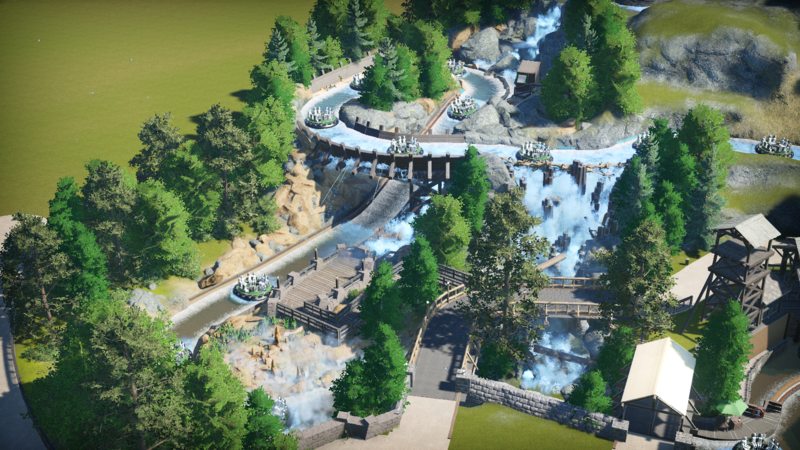 Im getting to the point where im a little over mountains and rockwork and want to dive into working on more architecture but for now till this beast is done... work continues on Grizzly River Run. The final drop is nearly complete. 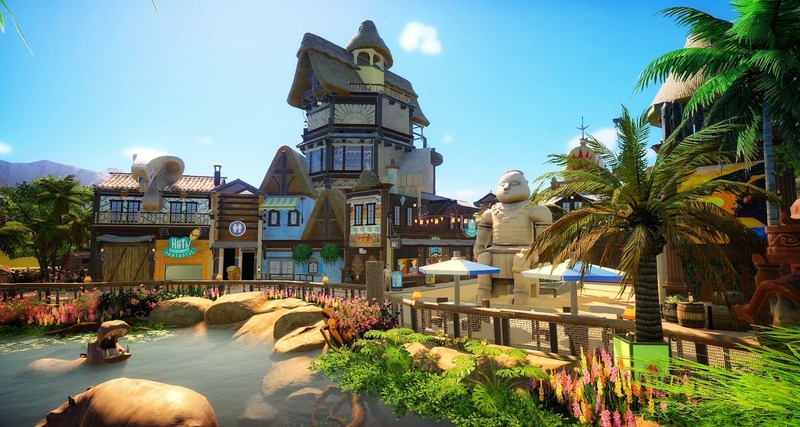 Just a student with a passion for themeparks. That roofline really catches the eye! Great to see you back, fella. And it's looking fabulous. Looking forward to the crocs. Nice stuff here buddy. I like that you are back on SGW, but I still love watching your vids. 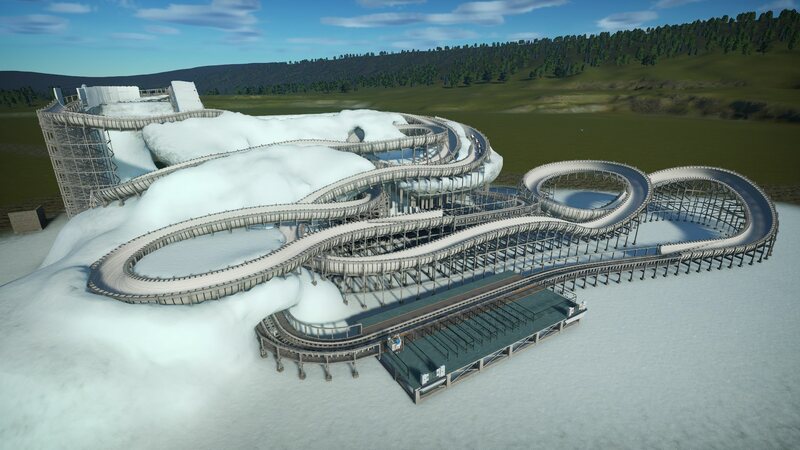 Decided to work more on my bobsled coaster. I want to add a chairlift over it. Of course, the game doesn't have an actual one (yet ). I tried the swinging suspended coaster, but there's nothing I can do about the catwalk on lifts as far as I know. 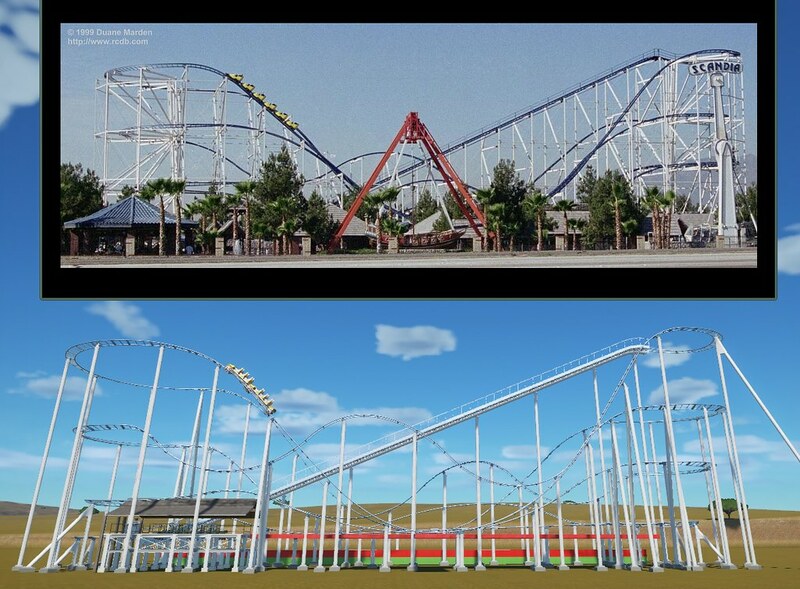 And the impulse coaster would just be silly (the launch pieces don't work on slopes, so it would have to start super fast.) I might have to settle for scenery unless there are any other suggestions. 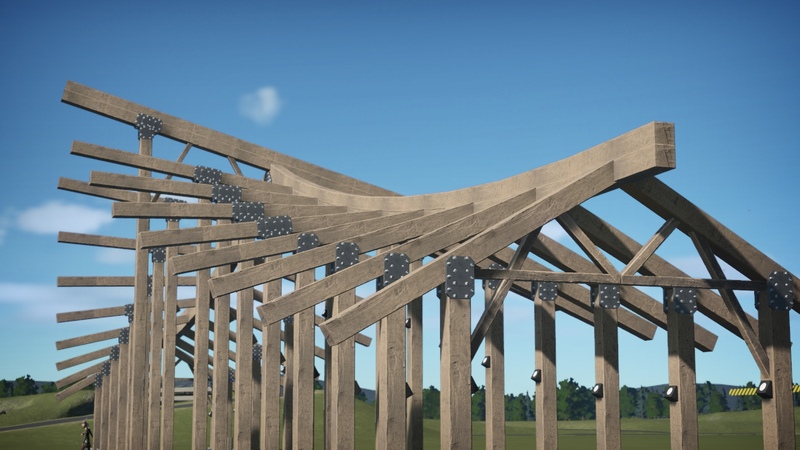 personally - I think that top overhang would look better with ground/mountain under it instead of those high supports. 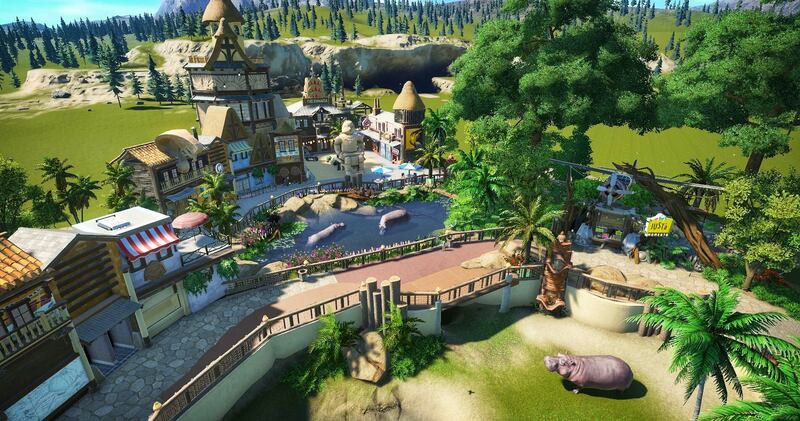 would just fir in better with the overall look of this ride's environment. Yeah, I'm still filling out the mountain, so I'll get to that. I was more unsure about the terrain overhang to the right of that. Looks like a lot of fun Sdanwolf. Love the vibrant tones of everything. 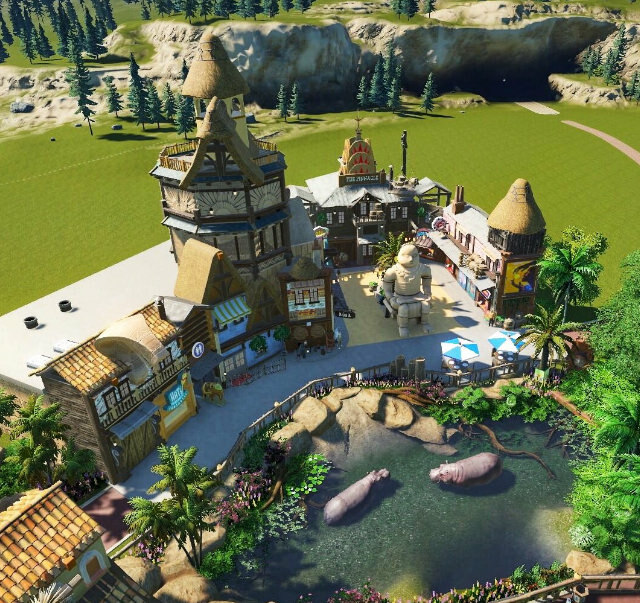 I Actually built a coaster and not another water ride! Time to custom support this mess. Just finished the stage of Planconia Festival: The Temple Of Madness. Wow, Zyned, that's another great stage! Evil jack-in-the-boxes! Very cool You sure have a knack for this sort of thing. Camelot! - It's only a .dat file - Shh! It's been too long since I popped back in here. Amazing stuff all around! I am working on my next totally custom-supported coaster life-size replica. This time, it's the Screamer at Scandia Park, Orlando, CA. It's another E&F Miler, the biggest coaster they've ever made at 88' of lift. 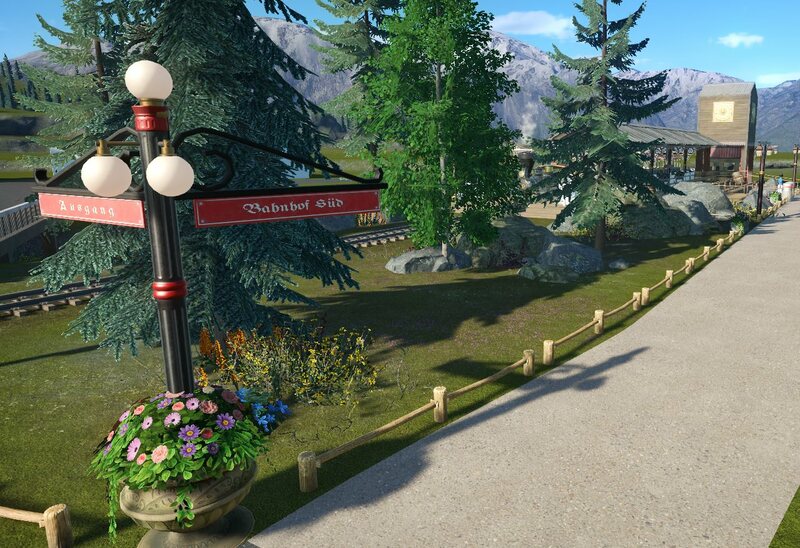 So far, I've got the track built and it's close enough to life-size for BSI work. The footprint is about 2m wider, 1m longer, and the lift is about 1m higher. Max speed is the same as the real thing. Even looks like the real thing, as you can see in the side-by-side comparison below.